My name is Chad Troftgruben. I am a freelance animator and screencaster who specializes in Moho and After Effects. I have spent several years learning different kinds of software while freelancing personal and commercial projects. Along the way I have collected a bunch of useful knowledge that can be translated into engaging video tutorials. So while I continue to create zany animated adventures, I want to share with you what I have learned. I have worked for several companies over the years creating eLearning content. Some of these include: Smith Micro, Virtual Training Company, Packt Publishing, Train Simple and Pluralsight. My animation is freelance based and isn't as well known as my eLearning content. I have a few animation projects I currently have my hands in. In addition, I work for others who need animation assistance. Home to my premium animation courses and files. 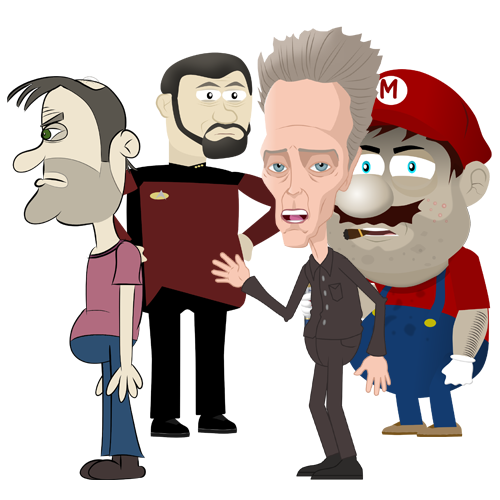 I teach and create assets for Moho Pro, Character Animator, Animate and After Effects. I’ve been animating my own productions for almost 20 years. Most of them are weird, but fun. Here is the full list for your viewing pleasure. Over the years I have worked for several companies and produced lots of YouTube tutorials. This page lists all noteworthy content.